The mill's manufacturing methods are essentially traditional. Hand moulds are used to form the sheets. Some moulds date from the 1880's. Most, however, have been made from mahogany hard woods and bronze wire more recently by Amies and Son of Maidstone, Kent, England. The Hollander beater , invented in Holland towards the end of the 18th century replaced the stamper mills. This style of beater has largely been replaced in large scale paper manufacture by continuous production refiners. However the method is vital to the preparation of paper pulps using long fibres to provide strong papers. Cotton and linen and in some cases, hemp, are mixed with water in the Hollander beater which crushes and fibrillates the cellulose fibres into a workable furnish. 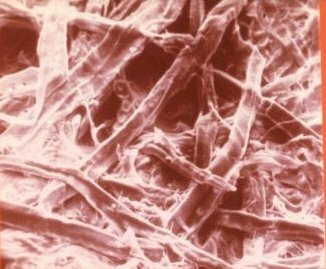 The adjacent picture shows a close up image of a typical interlocking of fibres. papermaker's shake he distributes it evenly across the surface whilst the water drains through the mould wire. This skilful operation ensures a randomness of grain direction which is illustrated in this enlarged image of matted fibres and contributes importantly to the paper's stability. This method was originally used in China before coming to Europe in the thirteenth century. Each sheet is then 'couched' - transferred - on to a special woollen felt and the woven felt is the initial source of the surface character of the sheet. Papers can be pack pressed in both wet and dry states depending on the nature of the surface required. A third pressing is given to those sheets requiring a completely smooth surface. loft drying where the paper is allowed to dry unrestrained and at variable rates depending on the climatic conditions (this is mostly used for papers subsequently to be gelatine sized) and restraint drying is used to maintain the flatness and regularity that is most often required particularly in typography and printing processes. Each sheet is then inspected for conformity to our quality standards. cotton, flax pulp, raw flax, refined and raw hemp. No optical brightening agents are present. Water is drawn from an underground pure source and is pH neutral at about 7.2. Tests have confirmed residual dissolved copper content at about 6.2ppm and iron at 14.5ppm. Pre-dyed fibres and natural earth pigments are light fast to at least level 5 on the wool scale. Inspite of the water quality and neutral nature of the raw materials, many papers need to be protected from pollution and acidic degradation. This is achieved by buffering with precipitated calcium carbonate. gelatine sizing where a waterleaf paper is soaked in a bath of warm gelatine solution and then redried. A pH corrected hide gelatine is used. This process is normally reserved for watercolour or calligraphy papers.